Everyone who has ever seen natural stone flooring knows, they make for a gorgeous accent in any room, home, or business. They are long-lasting, ancient pieces of history that can blend effortlessly both indoors and outdoors, to add a touch of refinement and interest to any space. 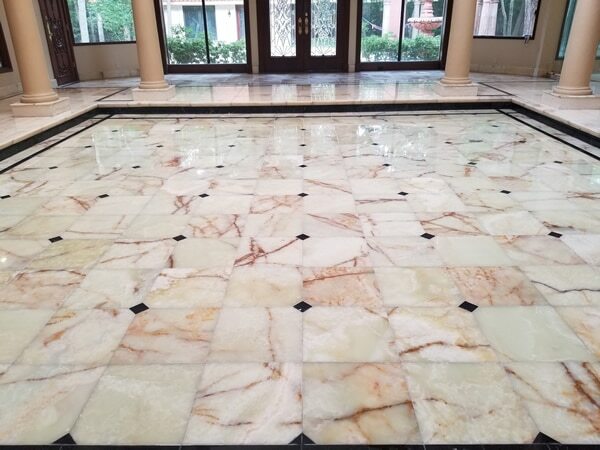 While natural stone flooring can be a bit of an investment when you first decide to have it brought into your home, it is a gorgeous product that when properly taken care of will last for centuries, meaning, it will outlive you! There is a reason when you look around the world at ancient structures that they are made from stone! Stone can withstand the test of time and maintain a regal beauty that leaves us all in awe! Make sure you have your stone floors regularly cleaned, polished, and sealed by the professionals at Modern Stone Care to keep them looking great! We live in Houston, Texas, meaning, we know heat! Carpeting holds and retains heat during the hot summer months, whereas stone flooring is actually able to remain cool and withstand the heat without warming your home. This is an excellent reason to consider bringing natural stone flooring into your home! The main attraction to natural stone flooring is its sheer beauty! Whether you are looking to add elegance, or just make a space more interesting and unique, natural stone flooring is the choice for you. It comes in a great variety and truly will wow all of your guests.